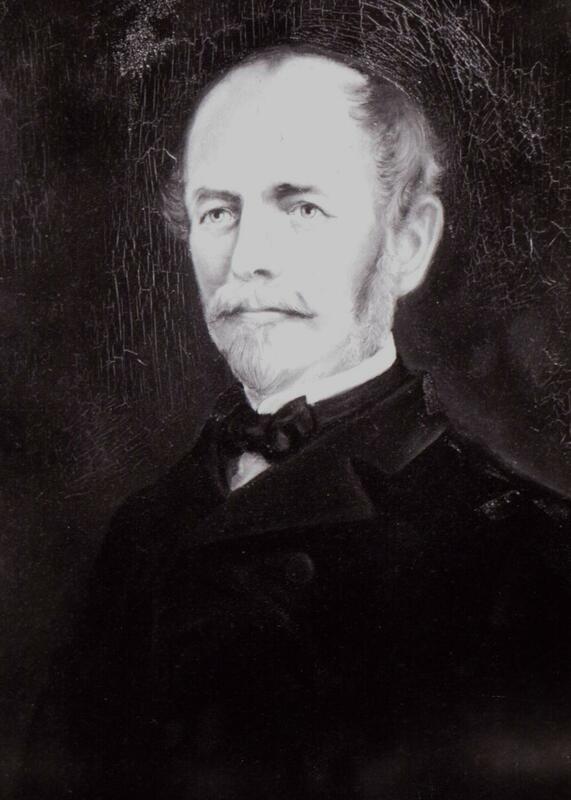 Joseph Eggleston Johnston (1807-1891) pictured circa 1860, as Quartermaster General, USA (black and white; original portrait in color, US Army Quartermaster Museum, Fort Lee, Virginia. There's a photographic portrait and short biography here). When Johnston was at the US Military Academy at West Point, he befriended R. E. Lee. Also while at West Point, Johnston became friends with Marylander William Hensley Emory (1811-1887), and offered to serve in his place at guard-duty after Emory was beaten up by another cadet. Emory didn't forget. After serving in the Fourth US Artillery, he and Johnston became officers and mapmakers in the Corps of Topographical Engineers -- after they'd both tried a brief stint as civilian engineers. They participated in the Second Seminole War, as did William Emory's younger brother John Register Emory (1818-1880), in turn another friend of Joe Johnston. A large number of papers have come to light at Poplar Grove, the Emory family estate in Maryland, including at least one letter from Joe Johnston to John R. Emory ("J.E. Johnston . . . The Rest is History," The Poplar Grove Project) posted here. On October 7, 1838, Johnston wrote to John from Brownville, New York, while surveying the Black River, a connector to the Erie Canal system, not far from Watertown, Lake Ontario and the St. Lawrence Seaway. Most of this letter consists of banter. For example: "I have just come from church where in compliance with the request in your last paragraph, I prayed fervently for your deliverance from all temptation -- particularly in the shape of women." And: "What has become of 'Brother Bill'? I have no news of him since his marriage, except your casual notice. . . Don't you get married until your friends are all dead. No man is worth a straw after it . . ."
Turns out that William H. "Bold" Emory had married Matilde Bache on May 29, 1838 in Philadelphia. Another joint comrade, Captain Augustus Canfield also of the Corps of Topographical Engineers, wedded Mary Sophia Cass (daughter of Lewis Cass) of Detroit, in Marleybone, London, on October 22, 1841. By the time of Canfield's wedding, Joe Johnston had already begun to woo Lydia Milligan Sims McLane (daughter of Louis McLane, President of the Baltimore & Ohio Railroad) of Delaware and Maryland. They "got married" in Baltimore on July 10, 1845, hearkening ironically back to Johnston's quip nearly seven years earlier, "No man is worth a straw after it . . ." Luckily for his military career, however, the Mexican-American War was right around the corner. Source for Canfield's wedding information: New York Society Library, "NYC Marriage & Death Notices 1836-1842." Available here.